The Global Berry Congress kicked off in Rotterdam this morning, with opening speaker Cindy van Rijswick of Rabobank predicting growth for the sector while outlining the challenges the berry industry is facing. "The worldwide berry sector is still growing," she told delegates at the World Trade Center. "For example, the berry market in western Europe is currently outpacing the overall fruit market, with growth of 8 per cent compared with growth of 1 per cent." Van Rijswick pointed out that growers and distributors are well prepared for future growth in the berry segment, with continued investment in varietal development, infrastructure, R&D and quality improvement. What is driving this continued growth? Consumer demand in particular, she says. "We have become a society of snackers, and berries fit nicely into the snacking trend. This is set to continue in future." It is not all smooth sailing for the sector, however, with van Rijswick highlighting several challenges for the berry industry to address. "Sustainability is important - for example, strawberries recently topped the 'Dirty Dozen' list, associated with having high pesticide residues," she noted. "Another problem is plastics, an area the industry must find sustainable solutions for - as it is an area many retailers are already looking into." The constraints of labour and the threat of trade protectionism are also potential barriers to industry progression, van Rijswick outlined, while also highlighting the dangers of the market growing too rapidly. too quickly, leading to prices bottoming out. "The overall forecast is for market growth to continue, but we must ensure that this is sustainable growth," she concluded. 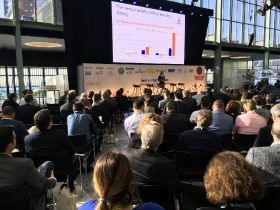 The Global Berry Congress 2018 is taking place on 19-21 March in Rotterdam, drawing nearly 500 delegates from over 40 countries and representing all links in the berry supply chain.